Norvan Falls is a spectacular waterfall hike located in Lynn Headwaters Regional Park, in North Vancouver. The trail to Norvan Falls runs parallel to Lynn Creek and is relatively flat. It is also accessible for most, if not all of the year, making it a great hike for the months where other trails at higher elevations are buried in snow. For this reason, this trail is also a favorite for early season trail running. While there is no sweeping vista on this hike to enjoy, the waterfall is quite beautiful, and the trail through the forest is itself rewarding. This is also a great trail for dogs, as the trail has only a gentle grade and there are plenty of water opportunities along the way to Norvan Falls. At the end of the parking lot, there is an information board and some brochures you can take. There is also a large map and some details about the hiking trails in the area – along with their estimated completion times. From here, head north to the bridge that goes over Lynn Creek. Immediately, you’ll come to a hiker registration station where you can fill out a form and drop it in the box (just in case). Go left from the registration station, and the first part of the hike is easy. You will follow the flat, wide Lynn Loop Trail north through second-growth forest for 1.9 km until you come to a junction and a trail sign. Going right here would take you up to Headwaters Trail, which is a possible alternative route to Norvan Falls, but adds more elevation and takes you away from the scenic Lynn Creek. Instead, keep heading north, now along the Cedars Mill Trail. Cedars Mill is aptly named; during this hike you will walk by several pieces of evidence of the extensive logging that took place in Lynn Valley in the early 1900’s, including a four-wheel log transporter. Follow Cedar Mills for about another 2.1 km until you come to an open area, known as Third Debris Chute, where you will join up with the Headwaters Trail. This is a good rest point, as you soak in the great view of Goat Ridge and Mount Fromme. Walking up the loose rocks at the debris chute, you will see the junction where the trail joins Headwaters Trail. Follow the junction to the north. From here the trail narrows into singletrack and becomes a bit more challenging, but not too much. Again, keep going north, following the numerous yellow trail markers. The trail will cut away from Lynn Creek and begin to roll up and down a bit. You will also pass through a few rocky stream-beds. After about 3 km you will come to a junction where you can go right to Coliseum Mountain – an ambitious undertaking. Stay left. Just beyond this point is another junction where you can head left to the Hanes Valley Trail and also to Lynn Lake (also ambitious hikes for another day) by crossing over the metal suspension bridge. Go right in the direction marked for Norvan Falls. From here there are only a few hundred meters remaining, and it’s a quick uphill climb to reach the 30-meters tall Norvan Falls. There is a viewpoint at the very top of the trail, but be careful not to get too close to the edge of the cliff. If you want to scramble down into Norvan Creek for a different view of the falls, there are a few safer spots to do so a little further back down the trail, but caution must be taken. From the view of the falls, you can rest up and get ready to head back out the way you came. If you wish to add some variety to the hike back, instead of taking the Cedars Mill Trail, you can take the Lynn Headwaters Trail from the Third Debris Chute and Upper Lynn Loop Trail all the way back to the parking lot, but this will add a bit of distance and time to the trip. You can check out the Metro Vancouver website for the Lynn Valley Regional Headwaters park for the latest trail conditions. 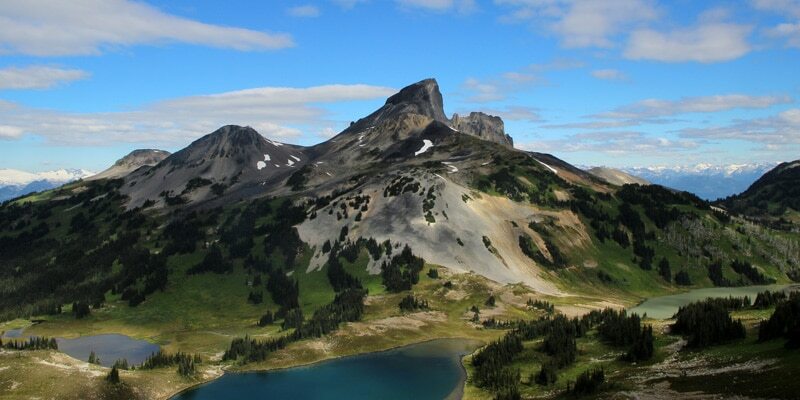 Lastly, if you want to add even more distance to this hike, you can also start at the Lower Seymour Conservation Reserve and access Lynn Headwaters Regional Park via the Lynn Headwaters Connector Trail, which skirts the west side of Rice Lake. Enter your email to receive the free PDF version of this guide. You will receive the file immediately in your email, and will also receive the free monthly Outdoor Vancouver newsletter. Trees along the Cedar Mills Trail. From Highway #1 westbound take the Lynn Valley Road (exit #19 north) in North Vancouver. Simply follow Lynn Valley Road all the way up into the Lynn Headwaters Regional Park parking lots, which are located on Lynn Valley Road, just beyond the End of the Line Cafe. The park gates are closed at different hours depending on the season, so make sure to note the closing time to avoid being locked in. Norvan Falls is a perfect hike to save for the rainy spring and fall months. The trail is relatively flat and enjoyable, and Norvan Falls itself is a great reward at the end of the hike. This is also a great spot for dog-owners. The trail is well marked and easy to follow. I took the Lynn Headwaters Trail up (moderate) and came down the Cedar Mill Trail to take a dip in the river. The trail itself presented no great challenges in terms of surface or mud. All the apparently raging creeks in winter (cutting the trail) were now dry. Compared to the Baden Powell – Deep Cove to Grouse – it was a breeze. This guide provided by Outdoor Vancouver helped a lot. I am thinking of coming back towards the end of summer to shower in the falls and swim in the pool, and then push forward to Coliseum Mountain. An excellent trail for training. I’m a little confused about where to start this trail. Do you cross the suspension bridge over Lynn Creek and then go left? As I have been over the suspension bridge many times but don’t remember a hiker registration box?! Can someone please give me detailed description of how/where to start this hike? could we do mountain biking on the trail to Norvan Fall? how much % is ridable? Bikes are not allowed in Lynn Headwaters Regional Park. A better bet very close by would be the Lower Seymour Conservation Reserve.